Thankfully it is a rare occurrence for the loss of a naval ship in peacetime but in this edition of the Review we report on the loss of the Armidale Class patrol boat HMAS Bundaberg following a major fire at Aluminium Boats Australia shipyard in Brisbane. This major incident appears to have gone almost unnoticed by the media. In recent memory our navy has generally avoided accidental ship losses, other than that of the small ammunition ship HMAS Woomera which sank after a fire off the New South Wales coast in 1960, the tragic loss of HMAS Voyager following collision with HMAS Melbourne in 1964and, the patrol boat HMAS Arrow sunk on Christmas Day 1974 during Cyclone Tracy. But to this we must now add HMAS Bundaberg and attempt to explain the circumstances leading to her loss. HMAS Bundaberg was an Armidale Class patrol boat designed and built by Austal at their yard at Henderson in Western Australia. The 56.8 m aluminium-alloy ship, one of fourteen built by Austal for the RAN, was commissioned on 3 March 2007. In June 2014 Bundaberg began a refit by Aluminium Boats Australia Pty Ltd at Hemmant near Brisbane. On the morning of 11 August 2014 a fire broke out in the vessel whilst she was out of the water in a large covered building at the shipyard. The fire could not be contained by local fire-fighting equipment and rapidly spread throughout the ship. With the help of Queensland Fire and Emergency Services, who were called shortly before midday, the fire was not brought under control until late in the afternoon. No one was injured during the fire, which may have been caused by welding operations, but the ship and the shipyard was extensively damaged. Following a survey to determine if the ship could be repaired, Bundaberg was declared a constructive total loss. Bundaberg was formally decommissioned at a ceremony at her home port of Cairns on 18 December 2014. The fire has also resulted in the closure of the shipyard, which was forced into voluntary administration, with the loss of 160 jobs. Whilst there has been no public statement to the effect that Bundaberg was a ‘constructive total loss’, that was clearly the effect of the survey. It is further understood the ship was totally insured for its replacement value in excess of $30m. The lack of an official statement about the loss probably stems from the complex web of responsibility for the ship at the time and the insurance implications. The Armidales are known to have had a number of problems relating to maintenance but recently these appear to have been overcome. 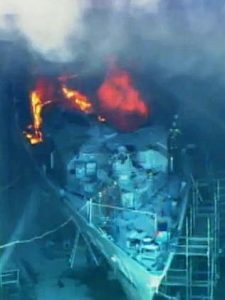 Bundaberg, in particular, previously had an onboard fire while undergoing maintenance in Darwin in 2011 which took the ship out of operation for several months. However, this latest fire again raises the argument about the suitability of aluminium as a structural material for warship construction. In many cases aluminium has been preferred over steel as it results in reduced displacement and therefore improved operational efficiency, especially fuel consumption. Its disadvantage is the low melting point compared to steel with a potential increased risk from serious fire which must be minimised by improved insulation and fire protection systems as are widely employed today in high-speed aluminium craft. When in dockyard hands internal ship fire protection systems may by necessity be isolated with reliance placed on other resources. While it is impossible to eliminate all accidents especially in such busy and confined spaces as ships in dock, experience warns us of the need for constant vigilance, to mitigate against such accidents. Great care must therefore be taken when welding operations are undertaken in ships in refit and strict precautions observed against possible causes of ignition. The loss of a warship and, seemingly the associated loss of a dockyard, is worthy of greater attention and exposure than this has so far received. Tow hundred miles west-south-west of the Canary Islands the Atlantic rollers surge endlessly eastward towards the African shore. In October 1941, these were dangerous waters infested by German U-boats ever watching and waiting for the helpless merchantmen. Among them was U111, a submarine of 750 tons, measuring 245 feet in length, and capable of exceeding 18 knots on the surface. She was commanded by Kaptain-Leutnant Wilhelm Kleinschmidt, an experienced underwater sailor with a crew of fifty-one, which included 4 other officers and a ‘makee-learn’ prospective captain Korvetten-Kapitan Heinecke. The morning of Saturday, October 4 1941, dawned bright and clear, with a little wind and a long low swell. U111 lay on the surface, her crew enjoying the early morning sun. The sea, as far as the eye could see, was empty, but unknown to Kleinschmidt, beyond his gaze as he scanned the horizon, lay the U-boats nemesis. At 0820 on that October morning Lieutenant-Commander A H Callaway, Royal Australian naval Volunteer Reserve, commanding HM Trawler Lady Shirley, was scanning those same Atlantic wastes o f water when he sighted what he thought might be the funnel of a ship. Suspecting, however, that it could be the conning tower of a submarine, he turned his ship to investigate. Meanwhile Kleinschmidt had sighted smoke from Lady Shirley’s funnel and though not alarmed, decided to dive. More than one hour and a half passed until at 1004 Commander Callaway’s patience was suddenly rewarded by an unmistakable contact. A pattern of depth charges was dropped, none of which damaged U111, but they certainly disturbed her crew. Kleinschmidt decided to surface, and barely had the rumble of the exploding canisters died away before the crew of the lady Shirley sighted the periscope rising from the depths. Callaway swung his ship hard apart to bring his single 4inch gun to bear, and as the Conning tower slowly emerged, his gun crew opened fire at 500 yards range. The Germans running along the submarine’s deck to man the forward 4.1inch gun were sprayed with machine gun fire and either killed or driven back. The survivors, however opened fire with a machine gun and killed the gun-layer in lady Shirley, whose place was taken by Sub-Lieutenant F F French, RNR, who scored three hits in rapid succession. 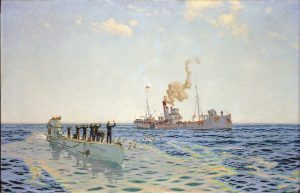 The action lasted for another twenty minutes during which several of Lady Shirley‘s crew were severely injured and eight Germans, including the submarine captain, died. The 4-inch fire eventually proved effective and the U-boat crew abandoned their sinking vessel. The U-boat was badly d amaged and already sinking by the stern when a few minutes later the surviving senior officer ordered abandon ship. 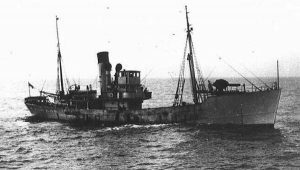 Forty five Germans were taken from the water, one of whom was moved to comment “we were bigger than you, we could see you, but you couldn’t see us yet you beat us.” The trawler’s crew of thirty then had then had the problem of containing forty-four surviving German POWs for the return trip to Gibraltar. On October 14 1941 Lieutenant-Commander Henry Callaway RANVR was awarded the DSO -” For great daring and skill in a brilliant action against a U-boat”. His First Lieutenant, another Australian, Lieutenant I P Boucaut RANVR, was awarded the DSC. In all another DSC, six Distinguished Service Medals, a Conspicuous Gallantry Medal and five Mentioned in Despatches were awarded to the members of the crew. Unfortunately none of them lived to receive their decorations as these brave men and the gallant Lady Shirley disappeared without trace while patrolling the western approaches to the Straits of Gibraltar on 11 December 1941. She was sunk by a torpedo fired from U-374. Based on an article in the Australia Navy Newspaper Jan 9 1959. 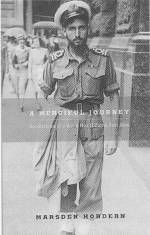 Merciful Journey – Recollections of a World War II Patrol Boat Man – by Marsden Hordern – The Miegunyah Press – imprint of Melbourne University Publishing Ltd., 2005. The distinguished author has been a long-serving member of the Naval Historical Society and a stout contributor to the REVIEW, so it is indeed fitting to review his latest book in these pages. This is an account of his unflinching service in the equivalent of small patrol craft during WW2 and which at war’s end found him in command of an HDML on the front line in New Guinea, disarming troops of a still large (100,000) and defiant Japanese Army. It says a great deal of the tolerance and humanity shown the sick and wounded by Australian servicemen to a brutal and skilful, aggressive enemy. The desperate search for Allied POWs was another priority, as the real danger of their ultimate execution by the Japanese Army to eliminate evidence of their own general inhumanity was a great concern. Marsden Hordern may have found himself at the sharp end of the wartime RANVR through the initial influence of his mother and the subsequent nurturing of his older and wiser shipmates, but it is evident that his naval training and acceptance of the risks and challenges encountered subsequently proved his mettle. We can be thankful that his regular letters home and to friends of a lifetime have been preserved to provide this factual story of young Australian men serving afloat in often acute hardship, particularly hunger and hygiene. Along the way he contributes his own reflections on the great navigators and explorers of this vast continent as he passed by their heritage detailed on his charts and sailing directions, and his books have this consistent theme of drawing out comparisons of his own navigation and the experiences of these earlier renowned seafarers. The book is well illustrated with original photographs to accompany the text and maps to allow the reader to follow his tracks. The pictures of the author may reflect a youthful and inexperienced young officer, but his cheerfulness and good companionship have made this a happy story, well worth the telling, and his later scholarship has embellished it with useful footnotes and illuminating asides, to round out his personal experiences. From my own experiences in small craft, in a similar environment in the Malaysian Confrontation up the Borneo rivers twenty years later, I can feel a professional bond with his minor war vessel and its miniscule crew, who served their country admirably under invariably difficult circumstances. The final chapter’s observations on the rapid demobilisation of such vessels in the RAN is a classic understatement of the enormity of the end-of-war task. However, one such HDML survived for many years as a tender to the training establishment, HMAS LEEUWIN, (as recently as 1990s) and some of her relics are preserved ashore in museums and cadet units. Small wonder that such useful craft are often dismissed as mere boats, except by that small number of accomplished naval surveyors and hydrographers who similarly share these privations in their daily work. The Australian Government has released a Request for Tender (RFT) for a replacement fleet to the Royal Australian Navy Patrol Boats that provide the frontline of Australia’s defences against people smuggling, illegal fishing, the narcotics trade and breaches of Australia’s quarantine regulations. 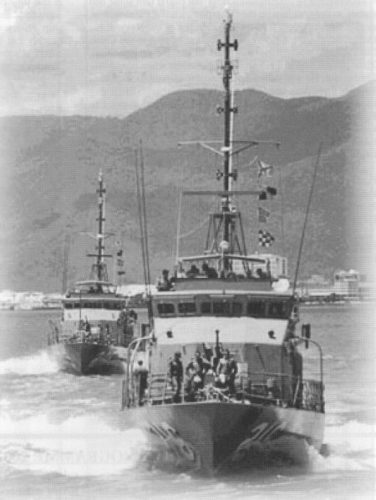 The fifteen 42 metre Fremantle Class Patrol Boats, armed with 40 millimetre guns, currently operated are almost 25 years old and are nearing the end of their working life. The Government’s Defence White Paper provided for a replacement for the Fremantle Patrol Boats. The contract for the new Patrol Boats will cover both construction and through life support of the vessels. The construction component of the contract will be worth up to $450 million dollars. The first new vessel will begin patrolling our waters in late 2004. The Patrol Boat force is home ported in Darwin (10 Patrol Boats) and Cairns (5 Patrol Boats). In line with the Government’s commitment to enhance surveillance in our northern waters, four Patrol Boats were recently transferred to Darwin, two from Perth and two from Sydney. The new vessels will be slightly larger and able to cope with heavier seas. They will continue to provide vital operational training platforms for navy personnel. The navy contributes 1800 Patrol Boat days each year to Coastwatch operations protecting our coastlines. The Government has indicated that it expects the construction to largely take place in Australia. It is expected that a single business entity will take responsibility for not only supplying the Patrol Boats, but also maintaining and supporting them for the duration of their 15-20 year life span. Furthermore, the $12.4 million upgrade to Darwin Naval Base is now complete and will provide a homeport for the updated fleet. The upgrade included construction of a 146m wharf, extensions to the existing wharf, additional fuel and storage facilities, and hard standing for cyclone protection. The new wharf has been designed to allow for a further extension to 200 metres, enabling it to cater for the larger vessels, which will replace the Fremantle Class Patrol Boats from 2004.